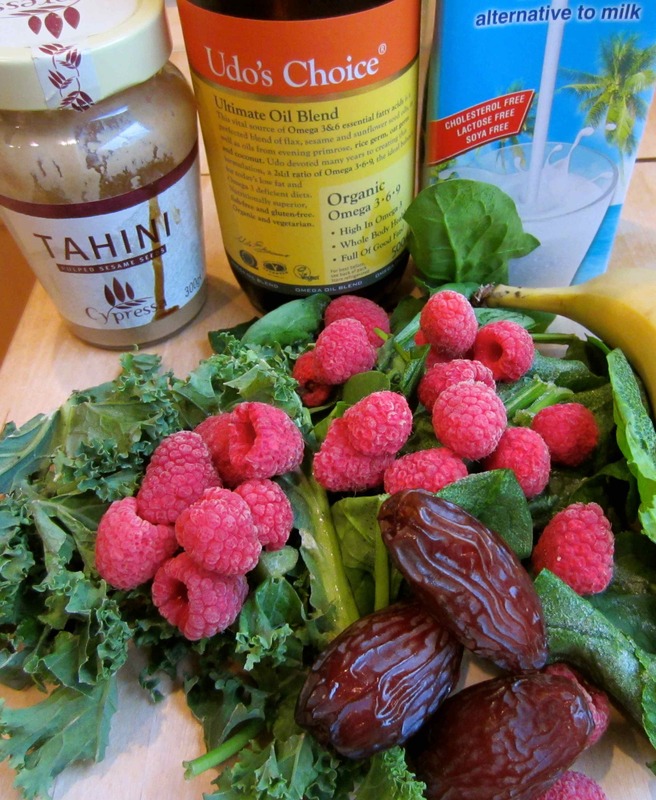 I went for another green smoothie today as I had forgotten how much I enjoyed them. 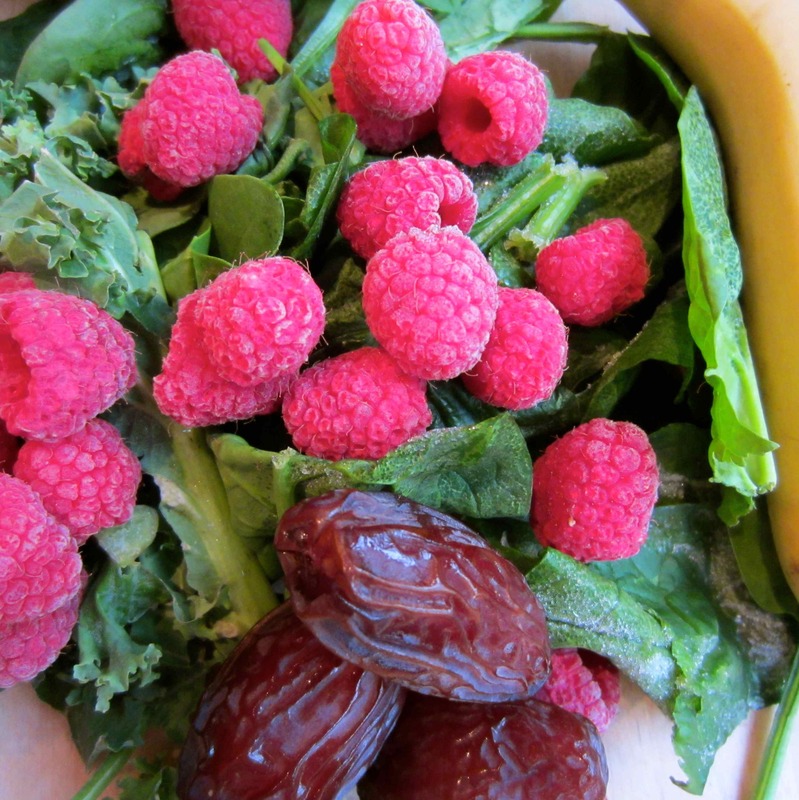 1 ½ cups coconut milk, 1 cup spinach and 1 cup kale, ½ cup frozen raspberries, 3 dates, 1 tbsp Udo’s oil and ½ tbsp Tahini. I intended to add the banana but I forgot and it was sweet enough without it. Not as tasty as yesterday’s but definitely green and certainly enjoyable. I made one for Harvey too but added cocoa powder and peanut butter to his instead of the Tahini. So he thinks he had a chocolate and peanut butter smoothie and is happily oblivious to the raw kale and spinach he had. Smoothies are such a good way to pack vegetables in to children. 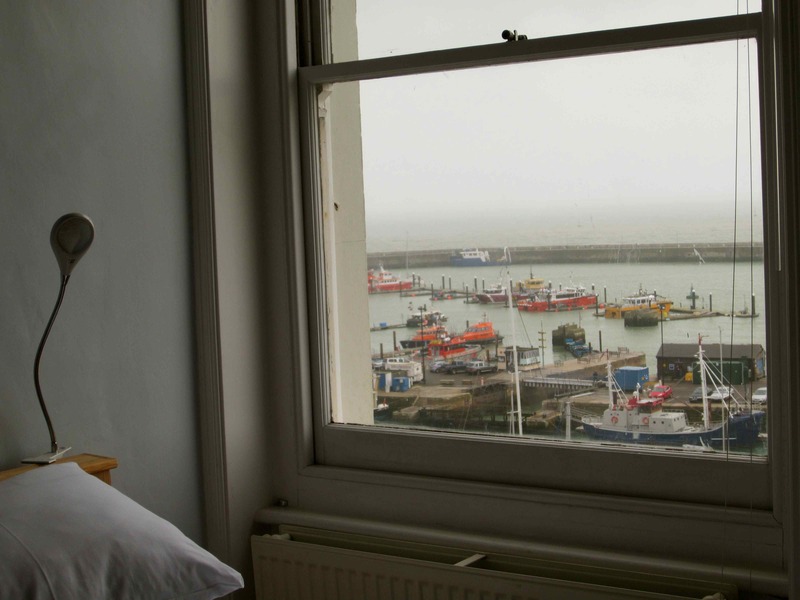 Today we went to Ramsgate to check the house over. We have just let it for 6 weeks to a firm of divers which is great but it means we can’t stay there ourselves. 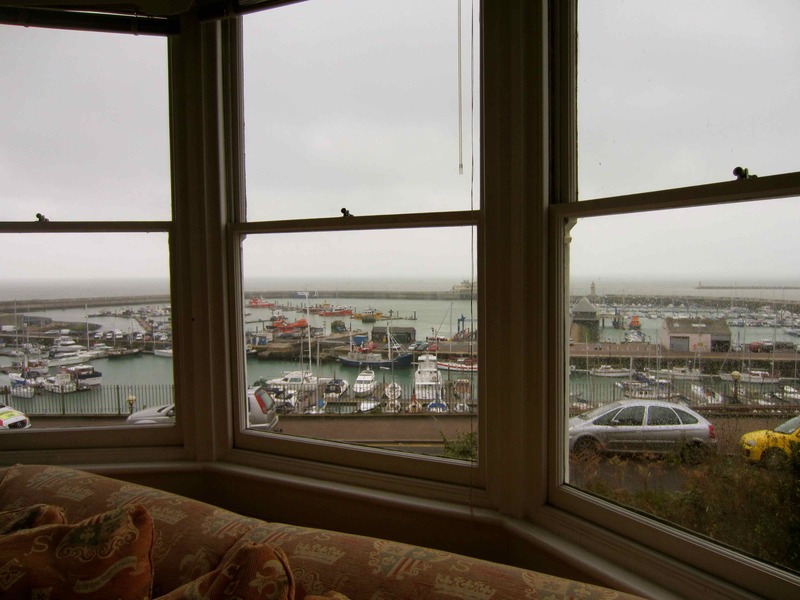 It is so relaxing sitting in this window, watching the happenings in the harbour, even on such a grey and dull day as today. I really like sleeping in this bed, with that view just inches away. It is so pretty at night time, looking out over the inky black sea with all the harbour and boat lights twinkling away. We will have to wait until January, which is when the house is next available. 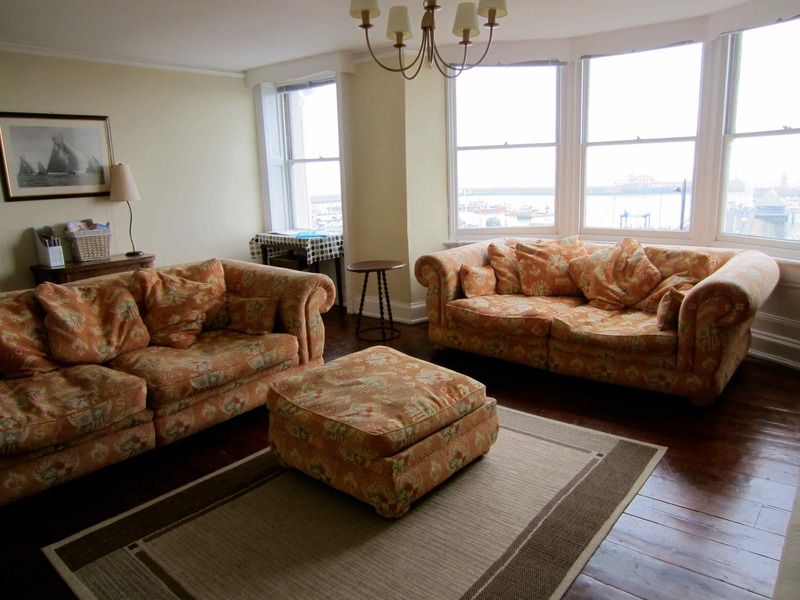 If you are interested in staying in this lovely house with its stunning views, enquire here . We planned to walk to Broadstairs for lunch and the tide times favoured us being able to walk along the beach which is one of my favourite walks. Unfortunately, the rain was relentless so we had to abandon the idea of a walk and instead drove round to a cafe I had wanted to walk to. This is a tiny little place along a residential road, just set back from the Bandstand in Broadstairs. There are 5 tables inside. 4 tables were occupied when we arrived so we were lucky to get a table but we stayed a while and it gradually emptied so I could capture the gorgeousness of it. I don’t like taking photos of people in cafes and restaurants. I had a latte while I browsed the menu. 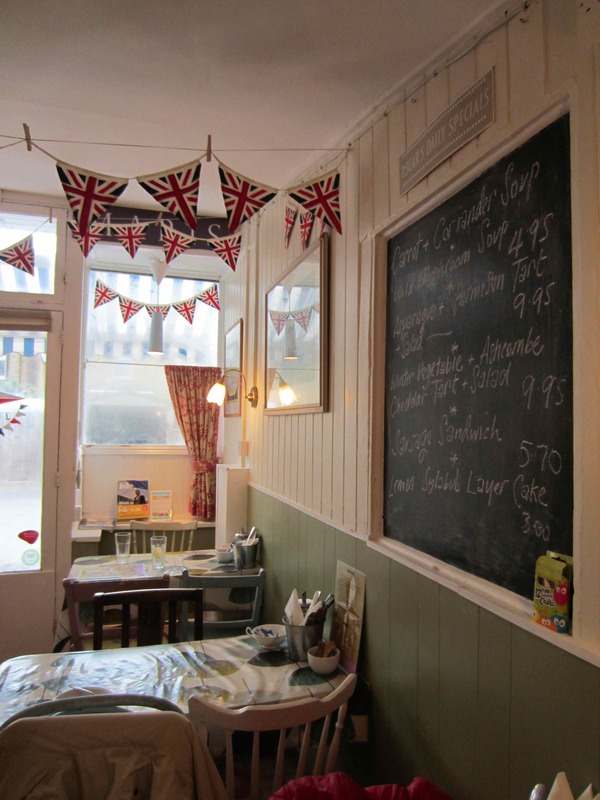 I chose from the specials board, which I always try to do as the specials are usually the best meals available that day. 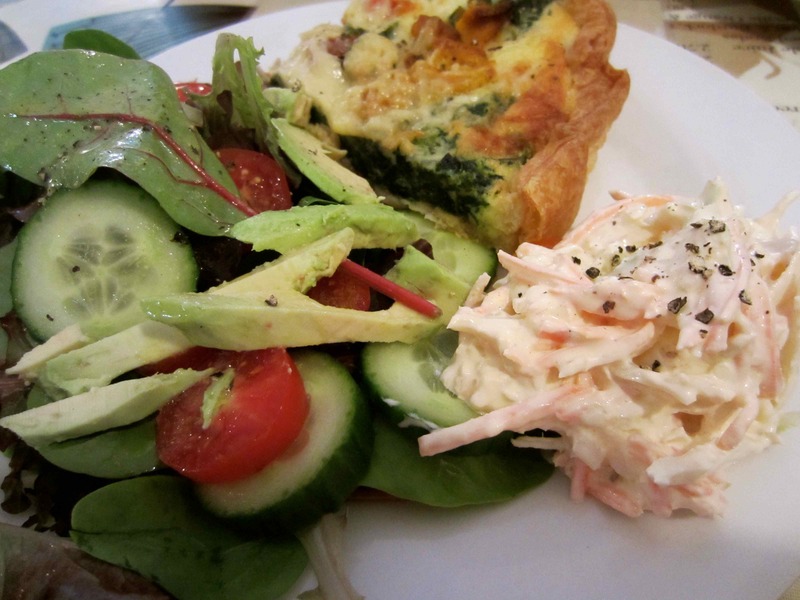 I went for the winter vegetable tart with salad. It was really good. 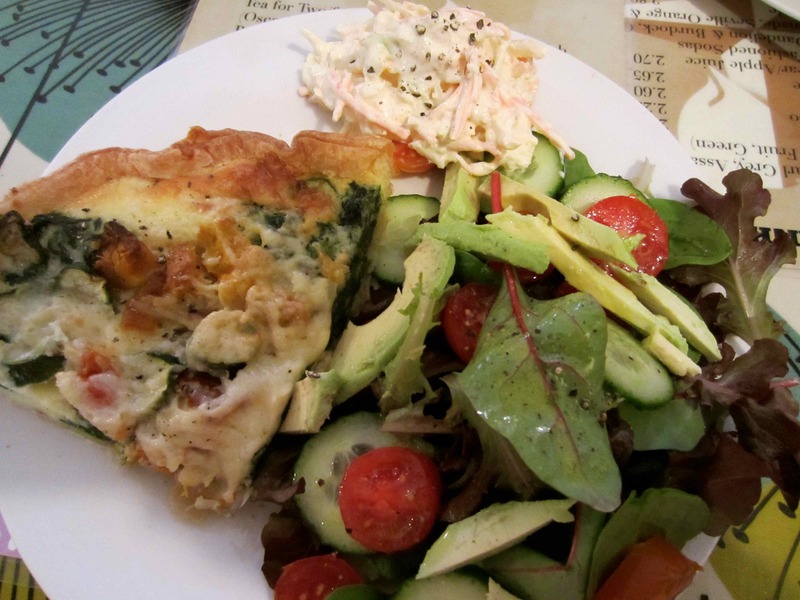 It tasted homemade and was full of vegetables such as spinach, broccoli and courgette. The salad was fresh and the coleslaw also tasted homemade. 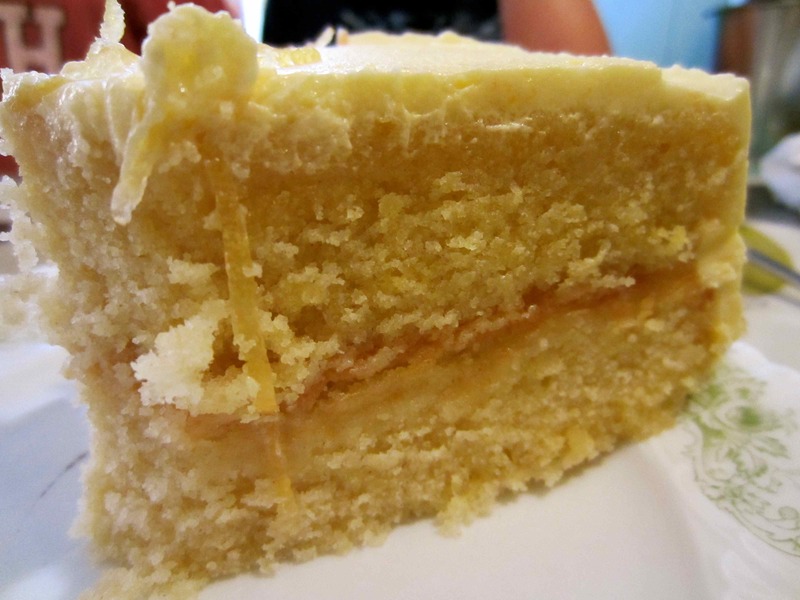 They have homemade cakes under glass domes and of all the things I love to eat but shouldn’t, I think home made cake is the hardest to resist. I failed to resist and had the lemon syllabub cake. Yummy. 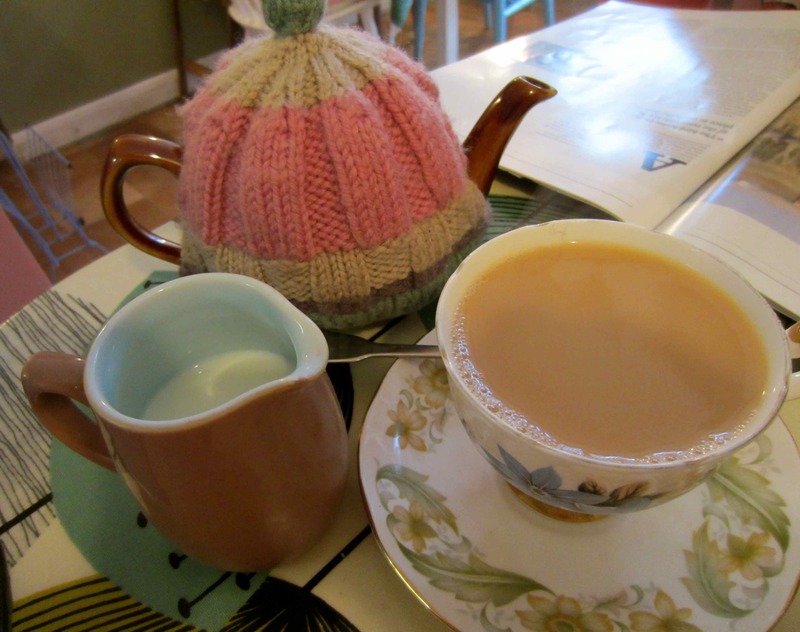 While we were enjoying tea and cake, the lady who knitted the tea cosy came in and was chatting. She belongs to a knitting group that meet every Thursday evening in the Queen Charlotte Pub in Ramsgate. This is a wonderfully quirky and unique pub, very close to our house which I previously blogged about here. 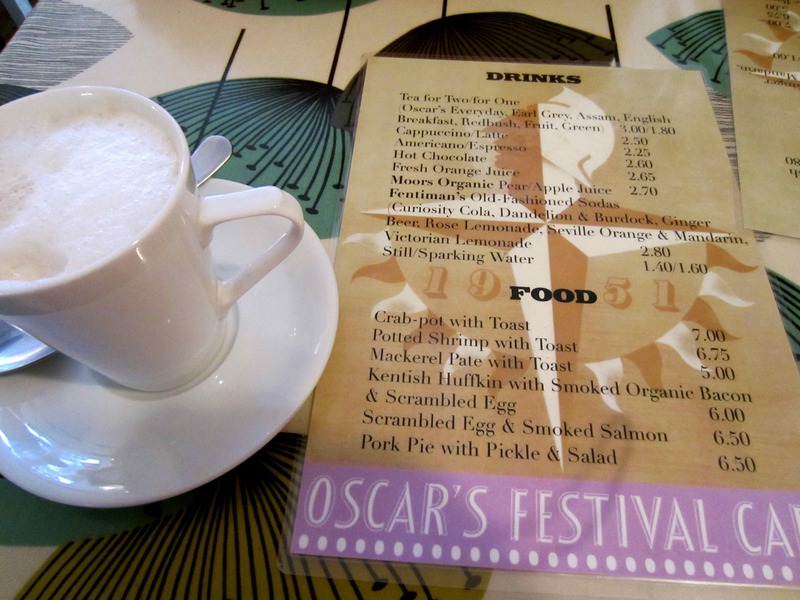 Oscar’s Festival Cafe is really quaint and charming. 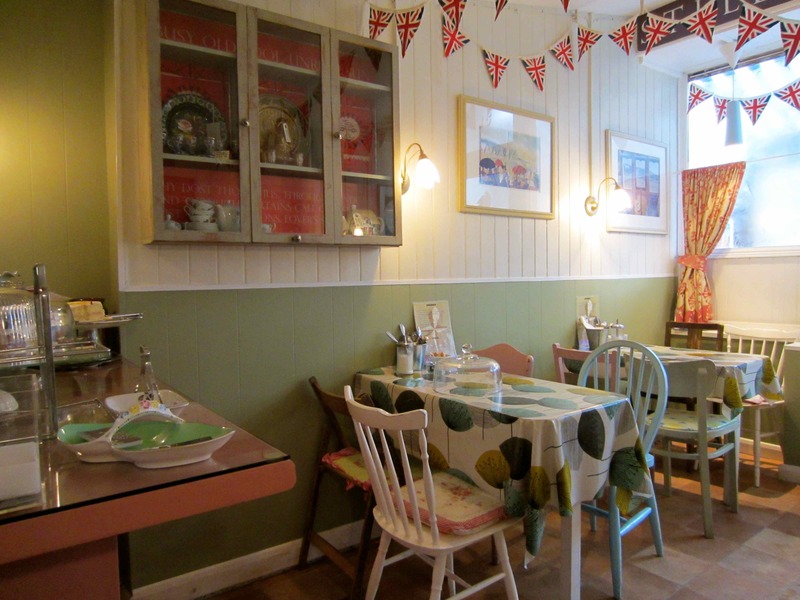 The owner was very welcoming and the service was very attentive. The food was all good too so we will be going back here. We shared a tub of popcorn in the cinema while we watched Skyfall and then a mango, raspberry and yogurt smoothie for supper. We didn’t need anything else though as lunch was so substantial. 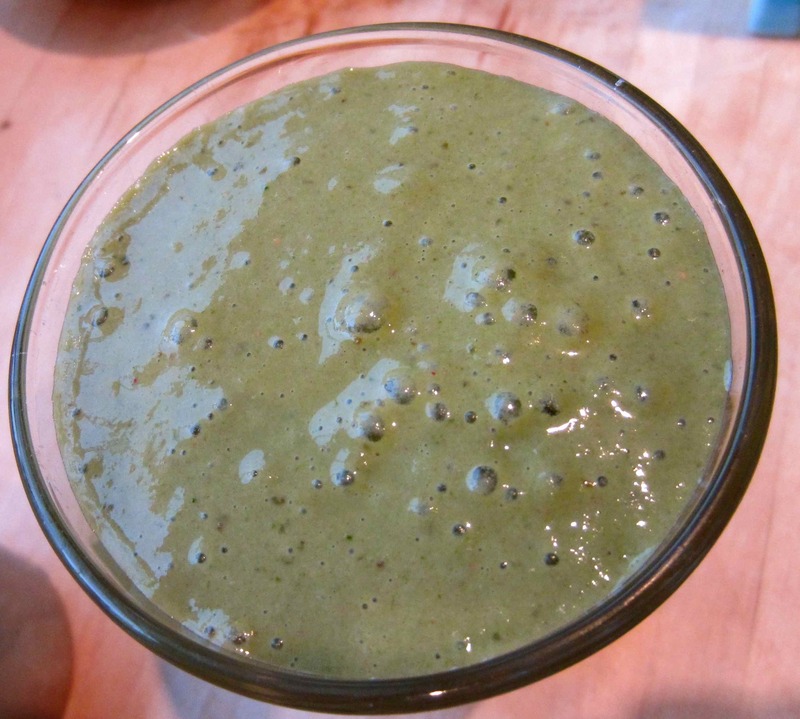 This entry was posted in Beach and tagged Broadstairs, Green Smoothie, Ramsgate. Bookmark the permalink. Harvey does too. We came across a couple in Florida and as he loves dogs so much, he has since been on a bit of a campaign to find somewhere we can take our dogs (eek!). So he was thrilled when there were 2 dogs in there. 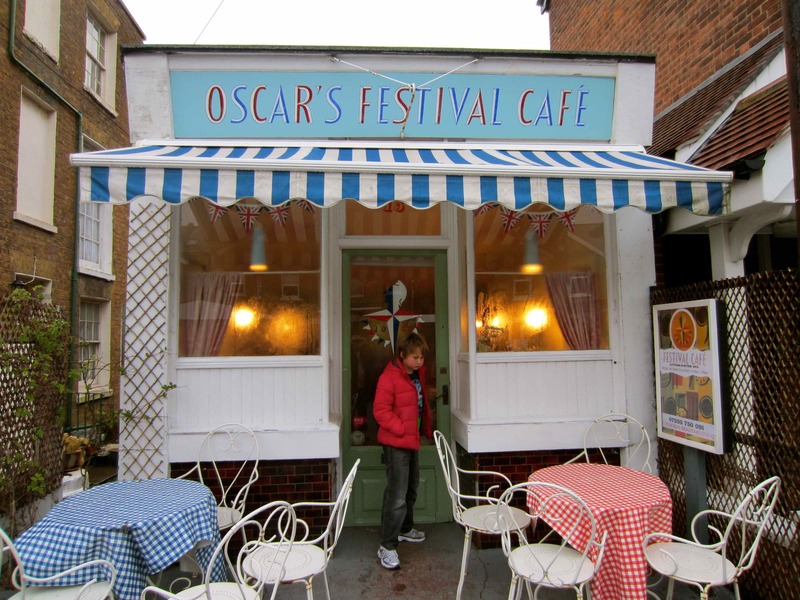 Unfortunately, tolerant and lovely as the owner of Oscar’s is, I think my 2 huge dogs would be too much! Thanks for the recommendation. Great photos Zoe; the house is looking fab. What a gawjus view from the living room. I did wonder who “veg grower up the road” was [I had a good idea], but a giveaway with the Ebony’s name in there!! Has my cover been blown? Or is Ebony a pseudonym for Beryl?? !